Registration for the 2019 DMDC trip is now open. Register here. 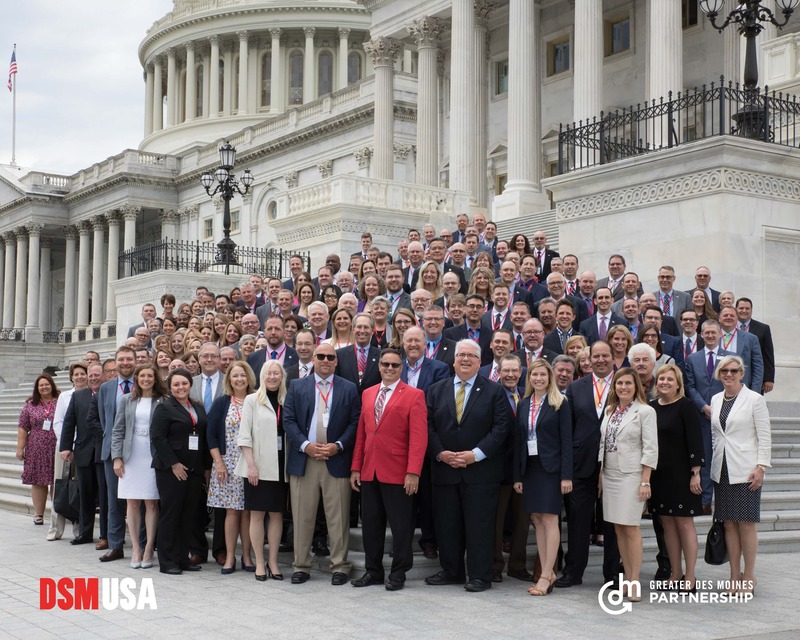 Each year in May, nearly 200 Greater Des Moines’ (DSM) business, civic and regional community leaders travel to Washington D.C. to present The Partnership’s Federal Policy Agenda. This is a unique opportunity to promote local economic development plans to Iowa’s Congressional delegation, the Administration and their staffs and advocate for key issues with one voice and one mission as one united region. Previous DMDC trips included events ranging from luncheons with keynote remarks from U.S. Congressional Members, Chamber briefings, workshops on topics, such as trade, health care and immigration and tours to famous sites, including the African-American Museum, Library of Congress and the U.S. Capitol. To learn more about the benefits of participating in DMDC, view recaps of all past DMDC trips. Download The Partnership's 2018 Federal Agenda (in full). The 2019 agenda will be available for download in May. "You can spend a year trying to make some of the connections you're going to make in three days." — Tony Dickinson, NCMIC Group, Inc. Contact Andrea Woodard for more information on DMDC at (515) 286-4924. Interested in becoming a sponsor for this unique opportunity for DSM USA to advocate for key issues with one voice and one mission as one united region? Contact Andrea Woodard for more information. Questions? Contact Joe Murphy, Senior Vice President of Government Relations and Public Policy. For public policy inquiries, contact Andrea Woodard, Director of Public Policy and Strategic Priorities.